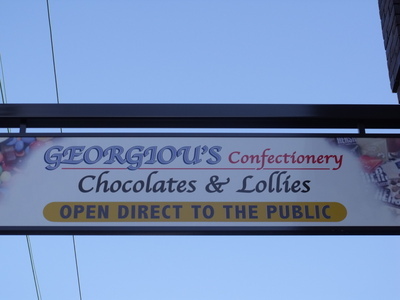 If you are looking for your next chocolate hit then go no further than Georgiou’s Confectionary. Located at 147 New Canterbury Road, Petersham, Georgiou’s is the largest confectionary store you will find in Sydney. Stocking a very large range of lollies and chocolates, there is definitely something for everyone’s taste. Georgiou’s has always been a family owned and run business. They stock both local and imported chocolates. The variety is endless with row after row of delightful treats. They stock a variety of chocolates from manufacturers that include; Baci, Lindt, Brown n’ Hale, Ferrero and Guylian. Also available are American name brands including Hershey and Reese’s. Depending on your personal taste flavours include dark, mild, and white chocolate products. Filling include peppermint, apricot, chocolate/caramel cream, strawberry, hazelnut, praline, pineapple, Turkish delight, raspberry, Irish truffle cream, cherry cream, cointreau truffle cream as well as franjellico truffle cream. Georgiou’s has a sugar free range of chocolates which include white, dark, extra dark, milk chocolate praline and milk banana. For those who grew up on freckles, liquorice, chocolate buttons, frogs, teeth, gum balls, honeycomb, jelly beans, musk sticks, snakes and bananas there is an ample supply of these available. If you are looking for the perfect gift then Georgiou’s will more than meet your needs with their pre made gift baskets to suit every occasion. Whether it is for a birthday, wedding or special event you can be sure to find what you are looking for at Georgiou’s Confectionary.